The Ditch Witch organization, a Charles Machine Works Company, has updated its line of fluid management systems to increase productivity and reduce costs on horizontal directional drilling (HDD) projects through improved drilling fluid flow, increased durability and faster mixing cycles and yield ti..
Hyundai Construction Equipment Americas announced the availability of a guarding package for its HL960HD wheel loader. Developed to protect the machine from job-site hazards found in various wheel loader applications, the guarding package for the HL960HD wheel loader helps ensure the operational int..
ICE KING, based in Midland, Texas, launched a new service to help companies better manage workplace and workforce hydration needs. A fleet of fully equipped service trailers containing freezers, water pallets and accessories, enable companies to ensure their workers always have convenient access to .. Updates to the 944K hybrid wheel loader provide increased fuel economy from the Interim Tier 4 model, improved operator comfort and uptime, and lower daily operating costs. “Customers deserve a dependable wheel loader that actively works to minimize downtime and cut down on fuel consumption,” said ..
Volvo Construction Equipment unveiled its latest concept machine, an electric compact wheel loader – known as the LX2 – to industry specialists, policymakers and academics at the fourth Volvo Group Innovation Summit in Berlin, Germany. This second-generation LX2 prototype is part of a research proj..
Thermoplastic valve and pipe manufacturer Asahi/America Inc. expanded its engineered plastic products and services offering, and fabrication capabilities and capacity by acquiring Louisiana-based fabrication shop Performance Plastics Inc. Performance Plastics was established in 2009 by Jason Rousse..
CASE Construction Equipment named its 2018 “Diamond Dealer” and “Gold Dealer” award recipients as a part of its North American Construction Equipment Partnership Program, which encourages dealers to excel in their role as a “Professional Partner” to customers. The Diamond and Gold awards recognize ..
Michels Canada opened a permanent office in the Greater Toronto Area (GTA) to conveniently serve eastern operations. Glenn MacIntosh was promoted to director, Eastern Region, heading up the office and spearheading Michels’ continued growth in the area and beyond. Formally established in Nisku, Albe..
Randy Hayes was promoted to vice president of Business Development and Strategic Accounts at Vacuworx. Previously leading the North American sales team as corporate sales director, Hayes’ expanded role allows him to more closely partner with national and key accounts, as well as focus on new busines..
CASE Construction Equipment dealer ASCO Equipment Company opened a new, flagship facility in San Antonio, at 1920 SE Loop 410. Covering more than 62 acres, the 45,600 square-foot campus is ASCO’s largest location, with 15,000 square feet dedicated for sales and rental operations, a 25,000 square-foo..
American Augers/Trencor, a Charles Machine Works company and leading manufacturer of horizontal directional drills, auger boring machines and large-scale trenchers and surface miners, launched a newly designed website. Bringing together the two brands with the message – “Two Brands. One Commitment” ..
ALLU allu.net ALLU Group Inc., based in East Brunswick, N.J., recently became a member of the Distribution Contractors Association (DCA). Based near Dallas, DCA is a professional trade organization formed in 1961 to facilitate the exchange of information related to construction and maintenance of ..
Raven Lining Systems, a leading provider of spray lining products to protect and rehabilitate manholes and underground infrastructure, celebrated its 30th anniversary throughout 2018. The company was founded and completed its first epoxy manhole application in 1988. That epoxy product became known ..
Greg Henry, P.E., LAN | Greg Olinger, P.E., CWA A major component of the Texas Coastal Water Authority (CWA) is the Lynchburg Pump Station and three, large-diameter pipeline distribution systems that make up the Trinity River Water Distribution System. 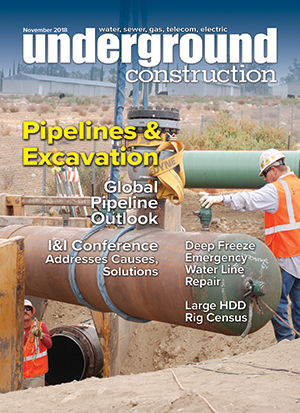 These three pipeline distribution systems, k..
EDITOR’S NOTE: This is the third in a three-part series on pressure pipe presented by the NASSCO Pressure Pipe Committee. There will be an in-depth program track on these topics and more at UCT, Jan. 29-20, 2019, in Fort Worth, Texas. For more information, visit the UCT website at uctonline.com. Pr..
A unique specialty conference, to be held in conjunction with the Underground Construction Technology International Conference & Exhibition (UCT), will tackle an age-old industry issue. Often misunderstood and frequently underestimated, unabated infiltration and inflow (I&I) is nonetheless deadly to.. When discussing the size of horizontal directional drilling (HDD) rigs, professionals typically refer to a unit’s maximum pullback force. The most common industry standard for large HDD rigs is pullback force of at least 100,000 pounds. In addition, other specifications associated with this category..
After providing services for nearly 30 years from its crowded residential offices, Northwest Housing Alternatives (NHA) was outgrowing its space. What transpired is the development of a new, multi-purpose campus where the organization can better serve low-income residents in Greater Portland, Ore. ..
By Jeff Awalt, Executive Editor Global energy trends and forecasts in the final months of 2018 and into the first quarter of 2019 continue to support a generally bullish outlook for oil and gas production and infrastructure construction to meet growing demand and evolving patterns of interregional .. The U.S. Department of Labor’s Occupational Safety and Health Administration (OSHA) has updated the National Emphasis Program (NEP) on preventing trenching and excavation collapses in response to a recent spike in trenching fatalities. OSHA’s NEP will increase education and enforcement efforts, whi..
BigRentz, an online construction equipment rental marketplace, announced the winners of its inaugural scholarship program for students pursuing higher education in engineering and film studies. From more than 350 entries, the company selected the winners based on their understanding and vision for t..
Vac-Tron Equipment was a 2018 Awardee of “Florida Companies to Watch,” a statewide program managed by economic development group GrowFL, in association with the Edward Lowe Foundation. “These stand-out companies are all led by entrepreneurs, and have demonstrated their capacity and intent to grow,”..
by Robert Carpenter | Editor-in-Chief Growing up in rural Oklahoma seems so long ago, so far away. It was a simpler time for many reasons, but nonetheless an enjoyable time and definitely life-shaping. Back then, the area’s primary economic drivers were wheat, cattle and oilfield (gas was viewed a..
Congressional passage of a water infrastructure package looks like a done deal, after the House easily passed the Senate’s America’s Water Infrastructure Act of 2018 (S. 3021). The main focus of the bill is authorization of some major Army Corps of Engineers’ projects involving dams and harbors. It..